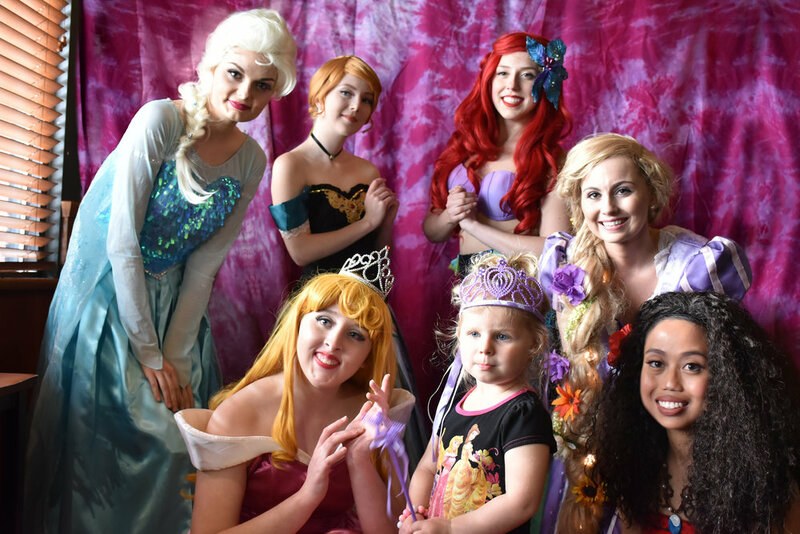 Scroll below to see the many adventures of the princesses, princes, superheroes, and other fairy-tale characters of Crowns Against Cancer as they bring magic, hope, and smiles to the beautiful children in Metro Detroit! Above: The princesses from Crowns Against Cancer teamed up with Wigs 4 Kids of Michigan for their annual Be A Star Gala September 9th, 2017 to bring smiles and magic to the beautiful children Wigs4Kids provides services to for hair loss due to cancer and other illnesses. They spent their time dancing the night away and sharing sweet treats with the kids, making them feel empowered and beautiful. These are the wonderful children we had the privilege of visiting! Scroll through each album to see the magical adventures the princess got up to at Beaumont Royal Oak and St. John Providence! Above: Our first visit at Beaumont, Royal Oak Children's Hospital. Left: We teamed up with Fleece & Thank You to deliver warm blankets to the warriors at St. John Providence Children's Hospital. We also made crafts! Thank you to all of the lovely kids who gave the princesses their hand-made crafts as presents! Right: Our Fundraiser at Boston's Restaurant and Sports Bar in Shelby Township! The princesses had a photobooth party complete with props (crowns, wands, princess gowns for the little ones, goofy glasses, beads, leis, and a grass skirt from our island princess!). The princesses also handed out stickers! Some princesses from Crowns Against Cancer made an appearance at Fleece & Thank You's Make a Blanket Day to make some armor for the fearless warriors at various hospitals in Michigan! Above: The princesses were invited to be guests of honor at International Children's Festival hosted by the Balkan American Association. This was a beautiful celebration of unity, appreciating children of all different cultures! Above: The princesses show off their silly sides, both with each other, and with the wonderful princes and princesses they visit! In this album, you also see pictures from bigger sponsored events where we met superheroes from another organization. Our new superheroes teamed up with Nico and the Schweizer family to raise awareness for a cure for FPIES at their walk in honor of their son Nico. We visited Nico at the hospital and when we heard that he had recently fallen in love with superheroes and that they got him through hard times in the hospital, we knew we needed to do whatever we could to surprise Nico and his guests! We are proud to announce we now offer superheroes as of the event of September 9th, 2017: Nico's Superheroes vs. FPIES. It is so important to us to connect with families in our community and unite for a cure for pediatric illnesses!